HVAC stands for Heating Ventilation and Air-Conditioning , is commonly associated with heating and cooling industry. is a system or machine that performs three major functions by its three separate ducts i.e heating, cooling and ventilation of air, generally used in residential commercial or Industrial buildings. HVAC – Heating, Ventilation, and Air Condition! This is an area of mechanical engineering that is concerned with the design of these systems in building architecture. Air Conditioning refers to the process where air condition units are placed at strategic points in the building (either in the form of centralized or individual) such that the energy costs can be minimized. Alongside, it is also important that the heat in the building removed most effectively, fastest and create uniform temperature conditions. Ventilation refers to the process where the stale air is removed. This is in concern with Kitchens etc. HVAC combines energy calculations along with fluid flow (in the building) through Energy simulations and CFD and utilizes them in understanding building physics. Heating, ventilation and air conditioning (HVAC) is the technology of indoor and vehicular environmental comfort. Its goal is to provide thermal comfort and acceptable indoor air quality. 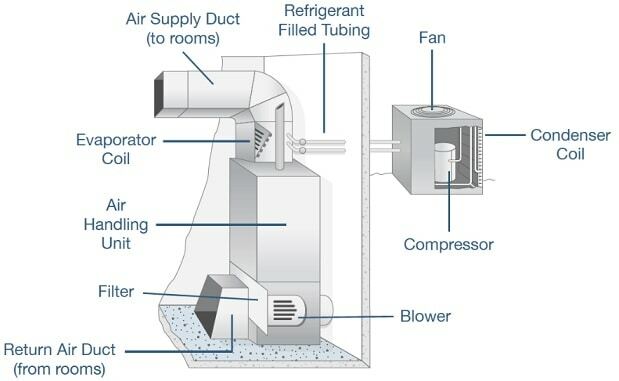 HVAC is an important part of residential structures such as single family homes, apartment buildings, hotels and senior living facilities, medium to large industrial and office buildings such as skyscrapers and hospitals, onboard vessels, and in marine environments, where safe and healthy building conditions are regulated with respect to temperature and humidity, using fresh air from outdoors. An air conditioning system, or a standalone air conditioner, provides cooling and humidity control for all or part of a building. Air conditioned buildings often have sealed windows, because open windows would work against the system intended to maintain constant indoor air conditions. Outside, fresh air is generally drawn into the system by a vent into the indoor heat exchanger section, creating positive air pressure.